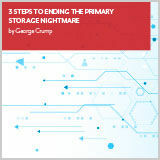 Storage is at the heart of most IT professionals’ daily struggle, and its challenges are keeping them up at night. The problem is that the organization is asking primary storage to do too much; meet performance expectations, keep up with capacity growth, retain data forever, recover rapidly and of course adhere to budget realities. IT planners need to rethink their storage strategy and not only look for storage systems that can better meet these challenges but also work with other technologies to ease some of the burdens on primary storage.